4. Teaching "Food for Thought"
This Educator Mini-Course provides a background for teaching the “Food for Thought” Middle School unit at your school. “Food for Thought” is a service-learning unit for the seventh grade that engages students in thinking about how food is grown and harvested, the challenges of meeting the basic need of food, and the issue of food insecurity in the world. Its curriculum is available for free on Learning to Give. This three- to four-week curriculum occurs mainly in English (during the study of the Steinbeck novel, Of Mice and Men), and also during Advisement, History, and Bible classes. At Westminster, the unit can be taught across these classes and in advisory because the entire seventh grade participates. Teachers and advisors meet before the topics are introduced and share ideas and best practices for incorporating the unit’s themes into their curriculum. Advisement is used to continue and deepen the learning, to have guest speakers, and to provide time for off-campus, experiential exploration of the topic. 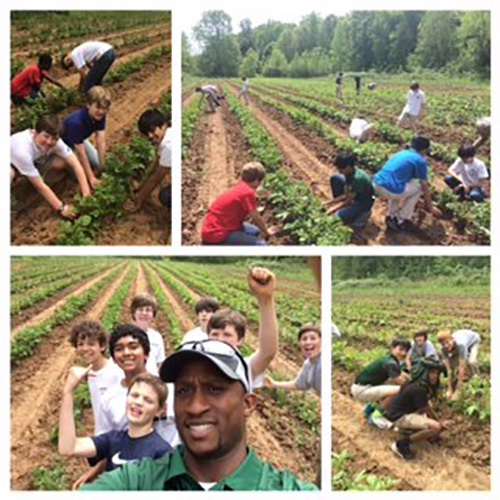 Students participate in service by working on a local farm and harvesting food. The unit also incorporates two service-learning projects, one in English and the other in Art. Through readings, research, site visits, local speakers, and service, students are challenged to think about food in a new way and connect to their local community. identify how philanthropic action can be used to address food issues. incorporate some of the unit’s concepts, content, and approaches into existing classes. This section provides a brief introduction to food and poverty themes, as well as sources to explore community gardens and farming. Some of the many topics that may be taught related to these themes include hunger, food insecurity, nutrition, cost of different foods, food choices, obesity, farming, food deserts, community gardens, farmers markets, federal hunger-relief programs, food pantries, and soup kitchens. What is the purpose of advocacy, and how can advocacy be related to nonprofit organizations? We explore the different forms of advocacy in this section.